The designation F.2C was first applied in February 1917 to a proposed variant of the Falcon-engined Bristol F.2B Fighter having improved landing gear, tail unit and engine installation. As these affected interchangeability and jigs had already been designed for large production, this variant was abandoned in March 1917 and the designation was revived in October for a new two-seater fighter-reconnaissance biplane designed for rapid production. It was severe in outline with unstaggered two-bay wings of equal span and small gap, and the pilot and observer were placed close together and high up so as to have the best possible view for fighting. The pilot's seat was below the centre section, which had a circular hole in it for the pilot's head. Armament comprised a pair of synchronised Vickers guns forward of the pilot firing through the airscrew and two separate pillar-mounted Lewis guns for the observer, one forward and one aft. The engine proposed was a nine-cylinder Salmson water-cooled radial of 260 h.p. with tall rectangular radiators on each side of the flat-flanked fuselage in line with the pilot's position. 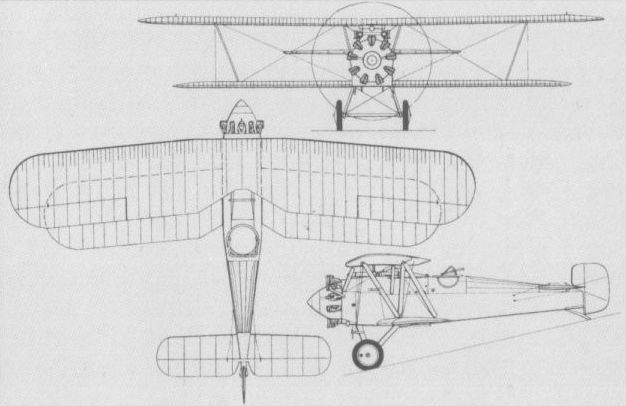 At the end of November it was evident that the Salmson engine would not be available and the design was revised, with wings of reduced area, to suit the Bentley B.R.2 rotary of 230 h.p. Neither of these layouts met with official approval because the engines selected were not powerful enough to permit overloads to be carried without performance penalties. Barnwell realised that at least 300 h.p. was required to meet the specification, and in April 1918 he submitted a new design based on the 320 h.p. A.B.C. Dragonfly air-cooled radial. This was a single-bay staggered biplane of unequal span and clean appearance, having many features derived from the Scout F. A fuselage mock-up was built and the layout of guns, camera, wireless and other equipment was agreed with specialist R.A.F. officers. Detail design went ahead, but no prototypes were ordered until September. By this time the Dragonfly engine had shown itself to be no more reliable than the Sunbeam Arab and was achieving an average life of only 17 hours before crankshaft failure occurred. Meanwhile Fedden and Butler of Brazil Straker had designed a new nine-cylinder radial engine of 400 h.p. called the Cosmos Jupiter. The contract for three prototypes of the F.2C, officially named Badger, allowed the second machine to be fitted with a Jupiter for comparison with the other two which were to have Dragonflies. Six weeks later the war ended and all production contracts were terminated, but experimental contracts were kept in being and the first two Badgers, Nos. 4254 and 4255 (F3495 and F3496), were completed. The first, with a Dragonfly, suffered engine failure from an airlock in the fuel system on its first take-off on 4 February and Uwins made a crash landing in which the landing gear and engine mounting were destroyed. It was repaired with a more pointed cowling and a larger rudder, and delivered to the Air Board on 15 February 1919. The Jupiter engine was late completing its bench tests, and the second Badger did not fly until 24 May 1919. 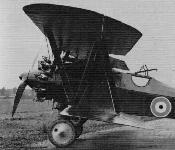 Barnwell shared Fedden's faith in the Jupiter as a promising civil aero-engine and gave him every assistance in installing it in the Badger, which was flown without armament, with the rear cockpit partly enclosed. No engine trouble occurred in the early flight tests, but the lateral control of the Badger was not satisfactory and so the third prototype, No. 4256 (F3497) was cancelled before delivery. The second Badger was formally purchased by the Air Board on 5 September, after having had a Dragonfly engine substituted for the Jupiter, with full armament and equipment installed; a fixed fin, added to improve handling with the heavier Jupiter engine and airscrew, was retained. When the Badger had been designed and before construction was completed, Barnwell had sent a 1/10th scale model for test in the N.P.L. wind-tunnel, to confirm the aerodynamic design; he was therefore concerned that the tunnel tests had given no warning of the lateral control deficiencies which appeared in full-scale flying. He had already emphasised the importance of the Company's having its own wind-tunnel and in March he and Frise designed a simple rectangular fuselage of spruce and plywood in which was installed a 240 h.p. Siddeley Puma engine bought very cheaply from the Disposal Board. To this were attached a spare set of Badger wings, tail surfaces and landing gear, and the result was a single-seat laboratory biplane whose flying qualities could be directly compared with wind-tunnel tests on a model. Known at first as the Badger Experimental, soon shortened to Badger X, this machine, No. 5658, cost only ?250 to build and was the first Bristol aeroplane to be entered on the British Civil Register, with the mark K110, which was revised to G-EABU on 30 May 1919. By that date it had already been written off, for, although Uwins made a successful first flight on 13 May, Barnwell himself nosed it over on 22 May and had to be released by onlookers from the safety harness in which he hung, helpless and cursing, upside down. He was uninjured and the aeroplane was not beyond economic repair, but the Directors decided not to go to the expense of doing so in a machine which could not easily be developed into a commercial two-seater. Barnwell himself had hoped to use the Badger X as a runabout and it was nicknamed 'Barnwell's Week-ender', though whether this referred to its proposed use or the extreme shortness of its design time is not certain. The Air Board were sufficiently impressed with the Jupiter's performance to order a fourth Badger equipped to full military standard. This was No. 5657(J6492) and was named Badger II. As at first built it had the same rudder as F3496, but this was replaced by a horn-balanced unit in conjunction with redesigned wings featuring large-area ailerons with 'park-bench' balances designed by Frise. Unknown to him, an exactly similar device had just been patented by A. V. Roe and Co. Ltd., who wrote to the Company pointing out the infringement; the matter was settled amicably and Frise then sought an alternative method of aerodynamic balancing, which later became world-famous as the Frise aileron, for which royalties were paid for fifteen years by many other manufacturers, including A. V. Roe and Co. The Badger II was formally purchased by the Air Council on 11 March 1920 and loaned to the Company thereafter for development testing of the Jupiter engine, of which the Company acquired the whole design and manufacturing organisation in July 1920. Several different engine cowlings were tested on the Badger II, the last being a polygonal type designed for the Handley Page 0/10 installation in July 1921. Badger. Like its rivals in the contemporary (1918) two-seat fighter/reconnaissance category, the Westland Weasel and Austin Greyhound, the Badger had two fixed Vickers guns, mounted much as on the Scout F, and one Lewis gun on a Scarff ring-mounting. This mounting was over a cockpit with cutaway sides to improve the gunner's view. The scheme was later reproduced in. (e.g. ), the Supermarine Seamew. Brackets for the ring-and-bead and Aldis sights were attached to the upper wing. Makers' figures for the Jupiter-engined version, which, at one stage at least, had the full complement of guns mentioned, included 170 lb for 'ammunition, bombs etc', but this figure would easily be accounted for by the three guns with a normal supply of ammunition. Mention of two guns in another makers' document suggests that one of the Vickers guns was, or would be, deleted in the event of bombs being carried. Intended as a successor to the F.2B two-seat fighter-reconnaissance aircraft, the F.2C Badger was designed for the 320 hp ABC Dragonfly I nine-cylinder radial, three prototypes being ordered. Armament comprised two fixed 0.303-in (7,7-mm) Vickers machine guns and a 0.303-in (7,7-mm) Lewis gun mounted on a Scarff ring in the rear cockpit. 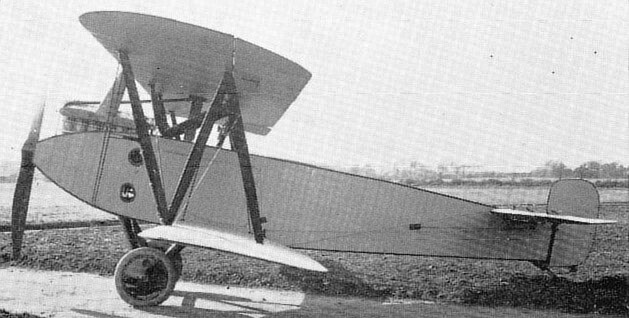 The first prototype suffered a crash landing as a result of an engine failure during its first take-off on 4 February 1919, but was subsequently rebuilt and flown. The second prototype was completed with a nine-cylinder Cosmos Jupiter of 450 hp and flew on 24 May 1919, but later had a Dragonfly substituted for the Jupiter. A third aircraft was completed as the Badger II with a Cosmos Jupiter engine and redesigned wings, this being re-engined in 1921 with a 385 hp Jupiter II (this power plant having meanwhile been taken over by Bristol) and subsequently being used primarily for engine development purposes. The following data relate to the Dragonfly-engined Badger. Max speed, 135 mph (217 km/h) at sea level, 129 mph (207 km/h) at 10,000 ft (3 050m). Time to 10,000 ft (3 050 m), 11 min. Empty weight, 1,948 lb (884 kg). Loaded weight, 3,152 lb (1430 kg). Span, 36 ft 9 in (11,20 m). Length, 23 ft 8 in (7,21m). Height, 9 ft 1 in (2,76 m). Wing area, 357.2 sq ft (33,18 m2)). 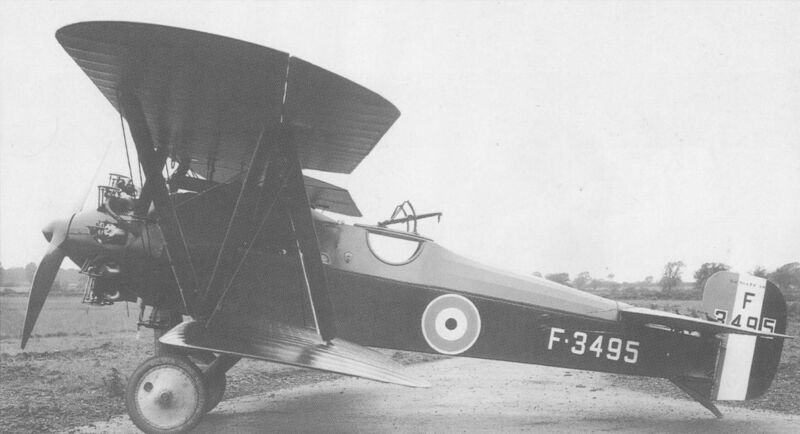 Badger I F3495 as rebuilt after suffering a crash landing on its first flight, with improved Dragonfly installation and larger rudder; Filton, February 1919. Badger II J6492 with Cosmos Jupiter I and park-bench aileron balances, at Filton in March 1920. The Cosmos "Jupiter" engine, 450 h.p., installed in a "Bristol" Badger. In the left-hand photograph the engine cowl has been removed to show the mounting. Badger II with Jupiter II and polygonal cowl in 1921. Badger X at Filton in May 1919. First Bristol F.2C Badger in its definitive form.